Out of all his paintings, Claude Monet's gardens at Giverny is one of his most grand and most well known. 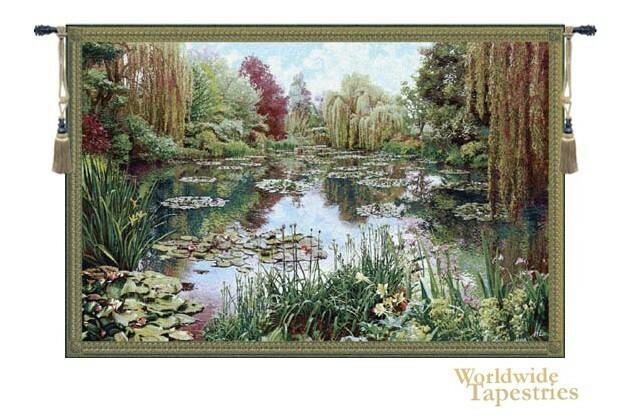 In Monet Lake Giverny tapestry, we see the entire vista of the lake and gardens in all its spectacular color and form. The variety of colors and foliage in this magnificent garden is incredible and is superbly captured in this grand tapestry. The lively tones and expert renditions of texture in this piece together with the idealistic yet real life composition is a visual spectacle to the eye. Monet (1840-1926) was the founder of French Impressionism and in this piece, we see the variegated and impressionistic foliage of the trees and lilies on the water and the contrasting glasslike reflections on the water. The sprawling gardens is maintained to this day in the same state as it was when Monet painted this and many other scenes from the gardens at Giverny which was a source of many of his popular works involving waterlilies. This tapestry is backed with lining and tunnel for easy hanging. Note: Tapestry rods and tassels, where pictured, are not included in the price. Dimensions: W 39" x H 25"
Dimensions: W 64" x H 39"
Dimensions: W 80" x H 51"
Dimensions: W 136" x H 80"